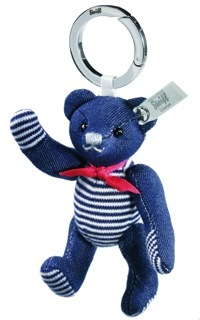 The Steiff Seaside Denim Teddy keyring pendant features denim head, arms, and legs with navy striped jersey fabric for his torso and paw pads. Perfect for keys or to decorate your handbag. Condition: New - complete with Steiff bag, Certificate of Authenticity and shipper. We are a smoke free establishment.